When the dice are racing, it is a good rumbling. Their six-sided body rolls over from side to side trying to get into the lead. Occasionally, some of the dice try to escape the whole peloton. Maybe now a group of two red make it, but they soon run out of power and peloton will swallow them again. It is essential to time the escape really well. Dice Run makes you into an escape artist. Its author is Spartaco Albertarelli and a whole game comes from Milano in Italy, which also houses the publishing company Kaleidos Games. 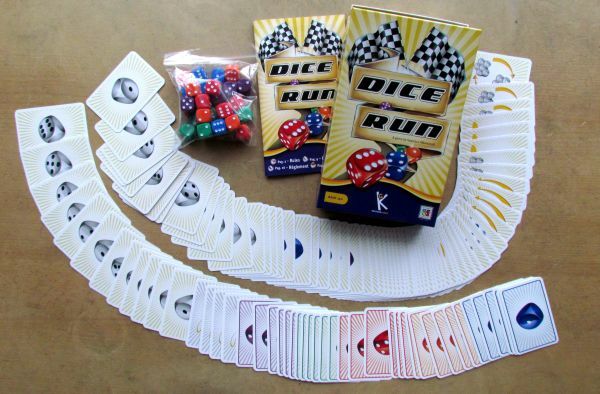 Dice Run itself is not completely new and it was first published back in 2002 (Kidultgame), but the 2013 version arrived to us with graphics by Chiara Vercesi. Box has quite a small size, just enough to fit everything you need inside. 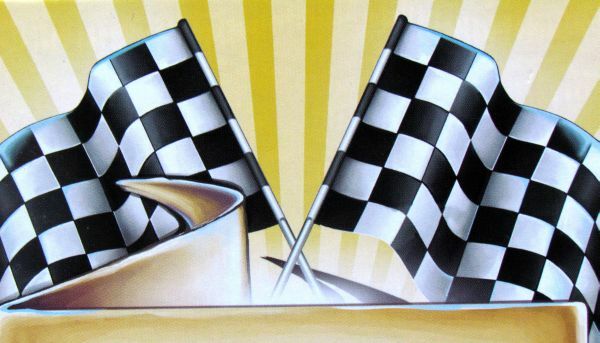 On the cover, you will see racing dice and necessary finish flags. Inside, there is a pile of thirty dice, six copies of each of the five colors representing cycling teams. 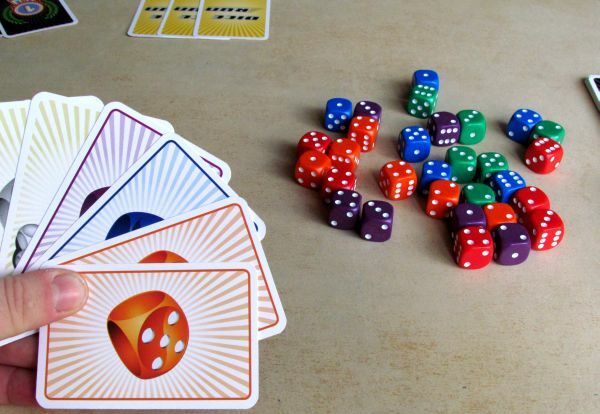 Equally important are surprisingly also cards in this dice game, which is equal to 110. 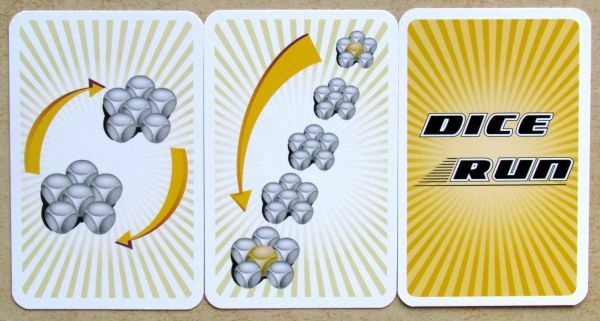 The largest deck contains movement cards with usually only one dice image. It is either white with a value or vice versa colored without dots. Among the motion cards, you will also find special actions, to which we shall return later. The deck also includes laurel wreaths, that are drawn on the back of the next thirty cards with secret tasks. You find a picture of concrete blocks on them, not only with color, but also particular value. Such dice you want to have at the forefront, when peloton crosses any of the measured sections marked by last four cards with victory cups. 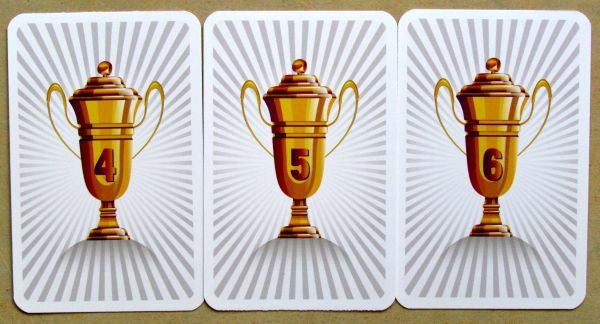 Just with shuffling of awards for the winner should you start setup of the game itself. Shuffled deck of cards is split into five piles and on all of them (except the first one) you place one card with cup in ascending order of values. Last duel to the finish line will be the most valuable, equalling to six points. 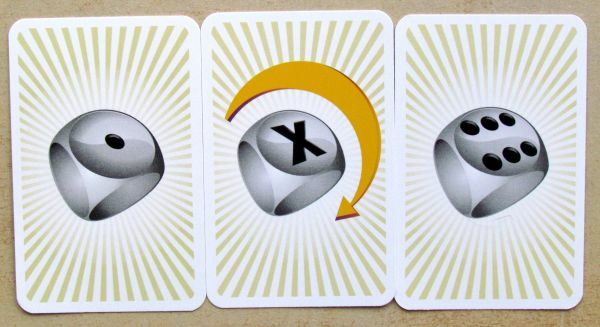 But before that, you must deal each contestant three movement cards, with which he will have to start the game. But now is the time to finally identify a secret mission for each of the participating athletes. Players receive four cards specifying racers (colors and values), which will be important for them. The preparation is finished by taking all thirty dice and rolling them. This is the starting field, that will soon tear into more groups. 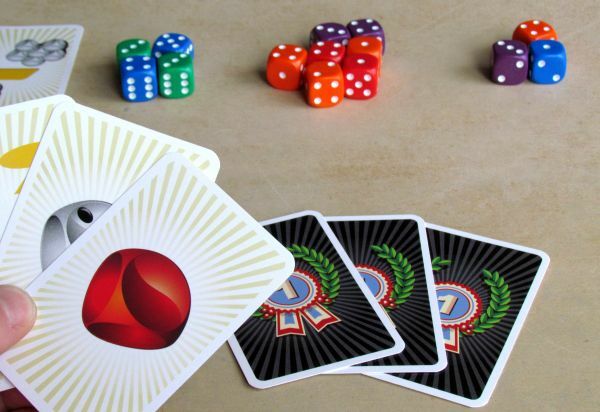 In each round, you play one of your movement cards, accordingly shift the dice with this value or color forward and then add a new card to your hand from drawing deck. This will either perform escape and from a new leading group or competitors catch up with group (dice) in front of them. 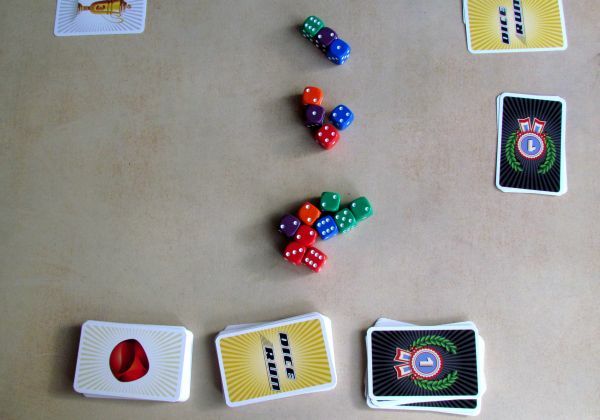 Dice jump this way back and forth in foolish and sometimes also futile attempt to get to the front of the race. The other players stand in their way above all, because they obviously have their own favorites. 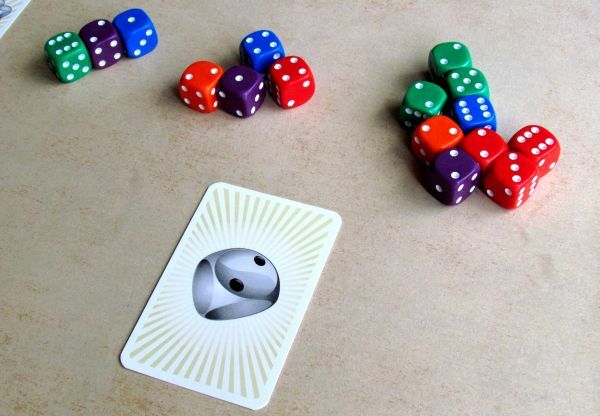 Besides moving dice forward, you can also use a special motion cards, that allow you to do some crazy stuff. You can expect the possibilityto re-roll some dice, swap two groups of competitors or vice versa create more space between them. 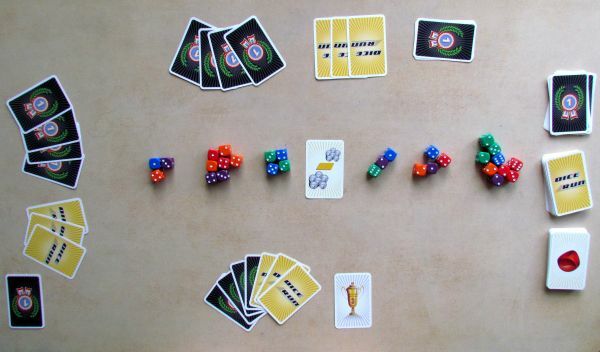 Players move dice back and forth, creating a combined group of dice again, until a card with a cup appears on top draw pile. At this moment, you entered measured section and it is necessary to determine, who won this part and how many victory points will he get. Each of the participants now has the opportunity to play any of his four secret tasks and score it. 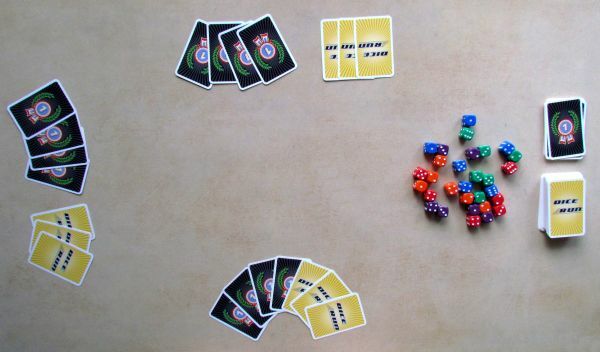 For a dice corresponding to color or number, player gets one point, while for exact match (number and color) three points. 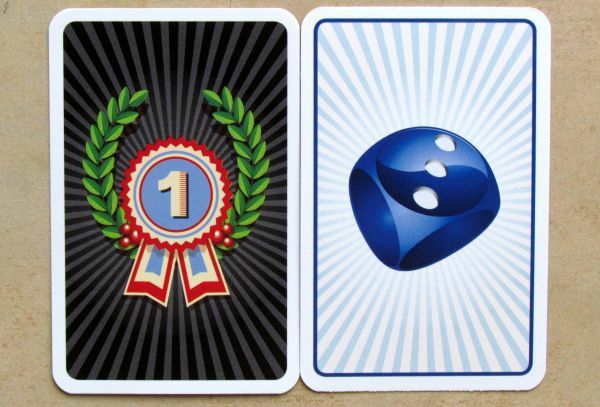 Whoever scores best in the leading group has won in this stage and gets a card with a cup. Other players in the ranking but do not remain short and split the price of comfort with a lower value. To track these points, you use back side of goal cards. That would be all, if players have not the opportunity to play and show their task card sooner. 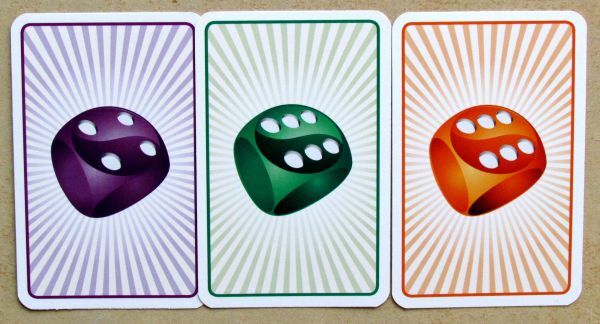 This card is a little joker and allows them to move forward not only dice of the corresponding color, but also of the same number. This is a very powerful combo, but at the same time risky maneuver, as it makes you weaker. 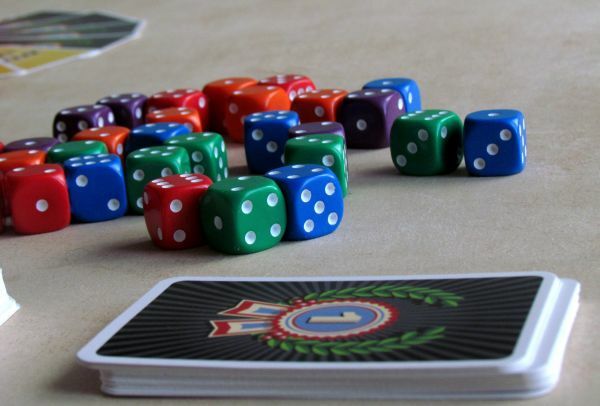 You must not be hasty and do it too early, because the other players then know, which dice are you trying to get to the top and work together to thwart your efforts. And then there is one very important option, that allows you to get rid of unwanted card from time to time. 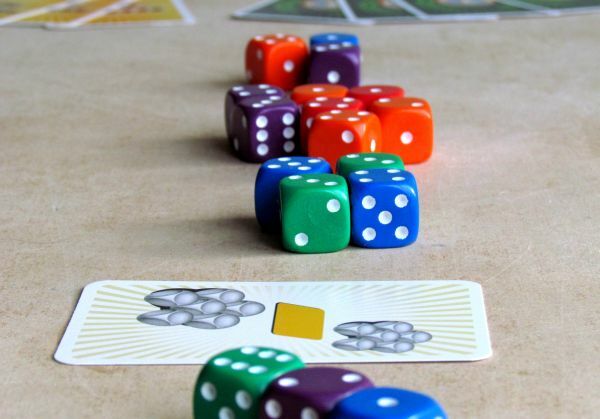 Instead of playing it regularly, you put it face down in front of you, select one group of dice and re-roll it to show new values. However, used card will lie in front of you, indicating you have used this option until some other player uses this option to his favor. All competitors gradually race through all four stages. On their end, you have just an easy task of determining sum of the collected cups and points for second and third place. And because the individual stages has not too large difference between first and second place, you have to try throughout the whole game. 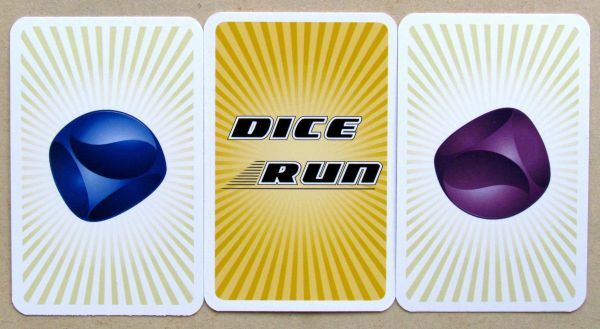 Dice Run is a racing game, in which dice have the lead role, but not such, as you would expect. It’s exactly the opposite, because the dice most of the time simply sit on the table and you are moving them using cards. This mechanism is quite clever and brings you some interesting decisions. Most important thing about the game are the secret tasks. It brings mystery to the game. But because each of your opponents is holding quartet of goals in their hands at the start of the game, they have broad selection in the early stages of game. They can race several different ways and follow alternate paths. It is very important to move not only those dice, you are interested in, but also some others. Much better off is to battle for top positions later, when you are closer to the front of the peloton. And raise less suspicion. Game is quite dependent on luck, but that comes out of random card draw. You have time to prepare well for competion based on your goals, but you can not move forward dice you want, unless you have the right cards in hand. In most cases, there is no other way to get rid of unwanted card during the game, but to play it. And this will bring you into situations, when you move pieces, you do not want to see in front. And you have to figure out, how to grapple with it in the best possible way for you. 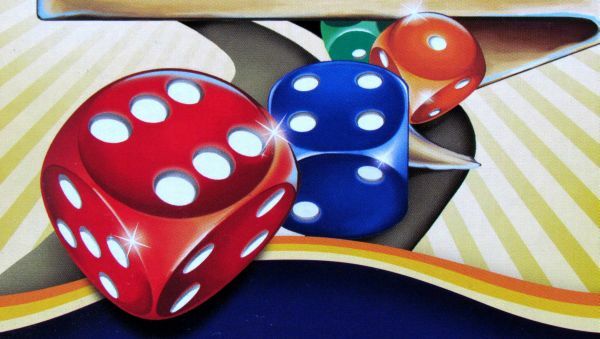 Unfortunately Dice Run simultaneously evokes a feeling, that you do not have any significant control over it. Actually, you just play the cards, you get in your hand and try to choose the right timing for them. 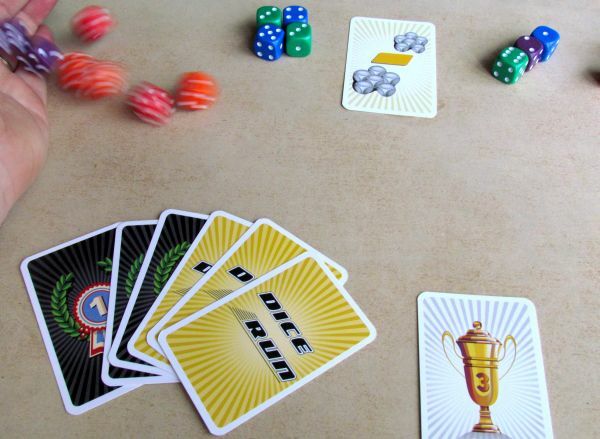 But the basic tactical options lies in the proper choice of goal card at the end of each stage and action cards, that can completely change the course of the race at the right moment. This is your way to victory. We do not understand, why this dice game is recommended by the box for players of age fourteen and up. You can play with a six year old without any big issues and that makes it a great candidate for a family racing game. At the same time, however, equally well suited for more advanced players and nice fun for a party, because it is crazy enough. 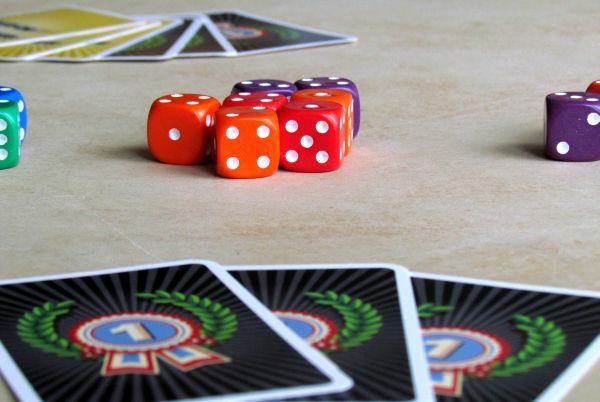 Everybody learns it in a few minutes and the only complex rules are related to the different types of action cards. Icons are clear and once you explain them, all will remember their meanings without any problems. 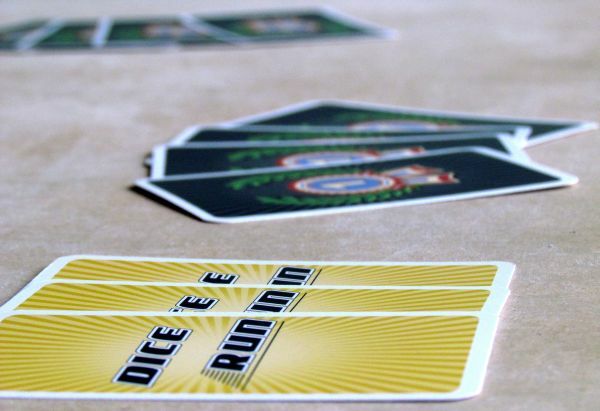 At the same time, game certainly pleases even with speed with which the race is over, even there is a lot of cards to go through at first glance. This will not stop you in arriving to finish with multiple opponents in thirty minutes. 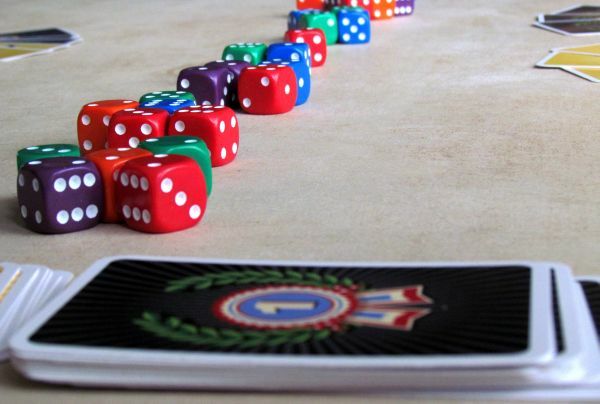 Variability is maintained by constantly changing dice and random distribution of goals. Ruck style of racing brings interesting situation. 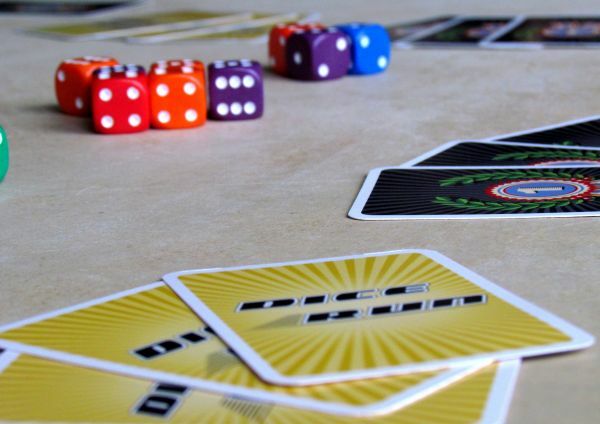 Dice really behave as a group and for all cycling enthusiasts, this game will be a pleasant surprise and perhaps even the best out there, when it comes to game time. But it will appeal also to players, who love Formula Motor Racing (review), which is surprisingly similar and also involves constant change of positions. 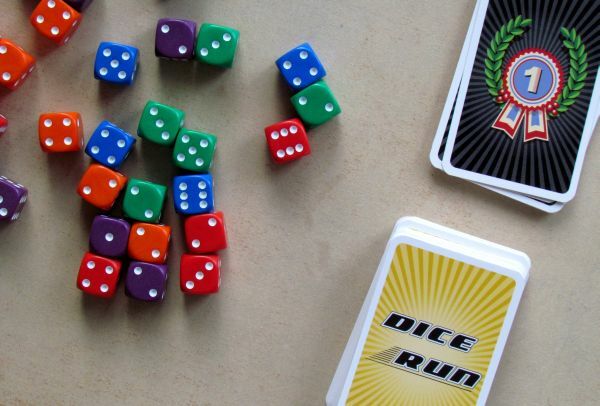 Dice Run is definitely not a game for someone, who does not like lack of control over development of the situation. 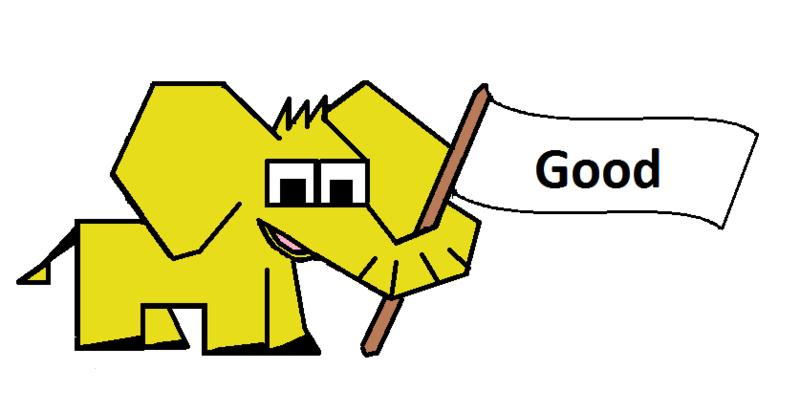 And of course its nothing for luck-haters. After all these misanthropes gone, we can recommend this interesting game for occasional racing. 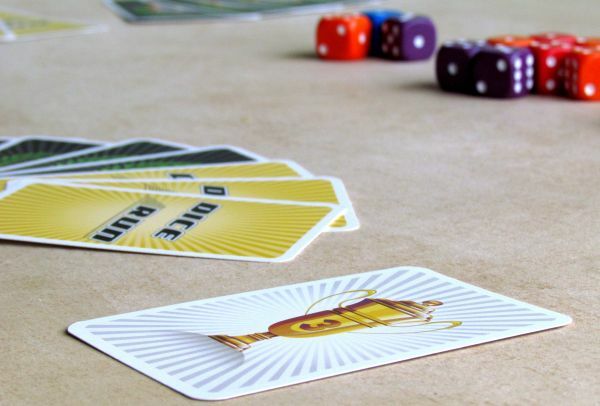 It brings a unique and clever way of using dice, allowing you to turn the rivalry on the track into fun. It’s not a game, that you get on the table every day, but it brings an interesting experience, that you will just occasionally like to try again. 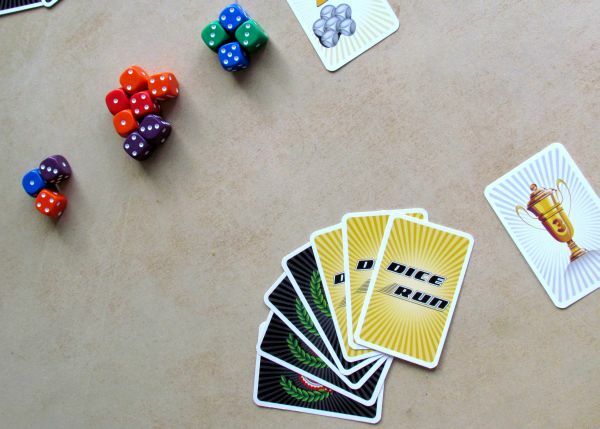 Dice are racing uphill in Dice Run and only one team can be a winner in each speed stage. What are you willing to do, to get to this leading position? All you have to is play the right cards, catch up groups and at the exact moment play a finish photograph. But a large part of your success depends on luck and cards, you draw. Game is therefore playing you in one way, instead of you having a total control. But that's usually naturality of dice games. Fortunately, whole game is quick and uses mechanism, which really reminds you of cycling race. 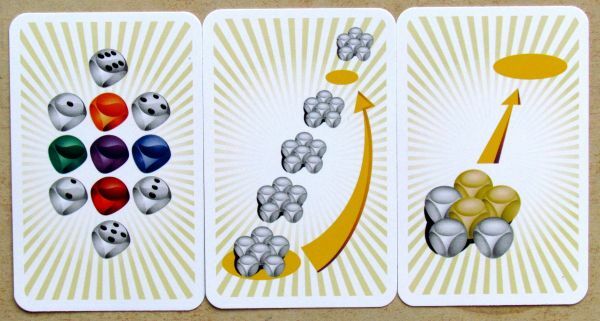 Dice are moved from one group to the other as they sprint and lose their strength. Gameplay and secret assignments make a really fun, although a pretty random game, in the end. An option to re-roll dice from time to time brings even more chaos to the table. But the crazy nudges will keep you entertained and that is important, because this is the main reason, why Dice Run is a little above average..